Peoria, IL - The Bradley Braves (12-13) (6-8) returned home for the Play4Kay weekend, supporting the Kay Yow Cancer Fund. After a brief two-game road stint, the Braves were up against the Evansville Purple Aces (3-21) (0-13). Coming into this one, Bradley had lost three in a row and five of its last six. Evansville was looking for its first win since December 14th. Out of the gate, this one was much closer than Bradley would've liked. The Braves were able to keep the game either tied or even get up to a five point lead on multiple occasions, but a three from Evansville's Kayla Casteel with 25 seconds to go in the quarter gave the visitors a two-point lead after ten minutes of play, 18-16. The Braves saw their lowest-scoring offensive output in the second quarter. As a result, the Purple Aces had the lead for almost all of the period. The Braves would tie it up on a Shunseere Kent layup at the 6:38 mark of the second, and even take the lead on four occasions, but Evansville came to play in the first half. A couple of free throws just before the break by the Aces' Kerri Gasper gave Evansville a 31-30 lead at halftime. Head Coach Andrea Gorski thought that there needed to be changes on both sides of the ball. "We gave up too many points, too many threes. We needed to get up tighter, don't let them get any threes off. Offensively, we had open looks. We were 0-7 from the three point line in the first half." Something was said in the Bradley halftime locker room, and whatever it may have been exactly, it worked. A Vanessa Markert layup at 7:14 in the quarter gave Bradley the lead, and they would hold that lead the rest of the way. The Braves were nowhere even near done in this quarter. Gabi Haack scored all nine of her points in the third. Anneke Schlueter had 11 of her 19 in the quarter. Vanessa Markert had seven of her game-high 21 points in the third as well. The Braves would hit four threes out of thirteen total shots, going 9-9 from the free throw line. That would propel them from a one-point deficit at halftime to a 27-point lead with just a quarter remaining, 72-45. Do the math, and that means Bradley poured 42 points in during the course of ten minutes. All Evansville was able to muster in this period was 14 points, which was almost their best scoring quarter of the game. If the Braves hadn't already shut the door on the Aces, they certainly were able to do that in the fourth and final quarter. Some reserves were able to see significant action as the fourth quarter went along. Kellee Clay hit a three, the first field goal of her career. Ryan Wilkins also hit a shot from distance. Amber Bozeman also got in on the 20-point fourth, hitting a layup with just 28 seconds to go, giving Bradley it's largest lead of the game, winding up as the final score. Bradley would come away with its 12th win of the year, 92-47. 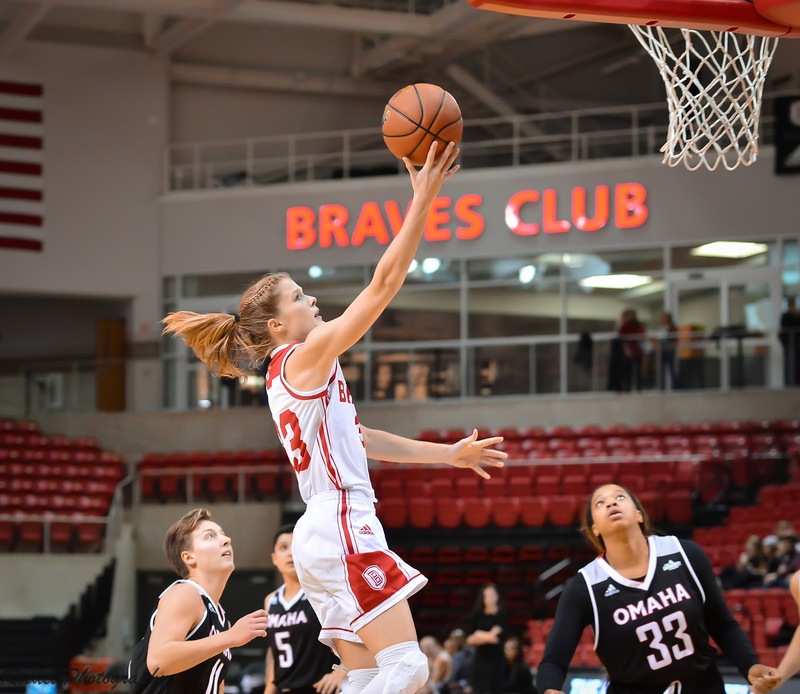 After the game, both Coach Gorski and Anneke Schlueter shared the same opinion that a three from Madison Dellamuth in the second half keyed the Braves' big push. As far as being down to Evansville after the first and second quarters, Gorski didn't think that fact had taken her team out of their rhythm, but rather, they "just get a little tight." She also added that they were "thinking too much". The game carried and added significance postgame for both Schuleter and Gorski, as the Bradley senior passed Gorski on Bradley's all-time scoring list. Despite the accomplishment, Schlueter was all about the team, and kept it simple after a long pause. "It's good for the team. Let's put it that way." The bench minutes were something that Coach Gorski was pleased with, and when asked about some specific instances, she had some good things to say about Kellee Clay. "When we played (Evansville) last time, Kellee didn't score. So, I know the team, they wanted Kellee to get a bucket. She's been a great senior leader for us, one of our captains, and works hard no matter what we ask of her." Schlueter said the whole team was "very excited for them", adding that "they give it their all in practice". The Braves will play host to Indiana State to wrap up a brief two-game home stand. When the Sycamores and Braves met back in Terre Haute, Indiana State would wind up coming away with the win, 65-50. As to what it's going to take for that to not happen again, Coach Gorski thinks it comes down to one thing. "We have to get off to a good start. We have to have a real good defensive effort in the first quarter. We just need to make sure we come out of the gates a little faster." Schlueter added a few more keys as well. "Confidence. Keep shooting. Go to the basket and just stick together." The Bradley - Indiana State game tips off at 2:00 pm Sunday from Renaissance Coliseum.